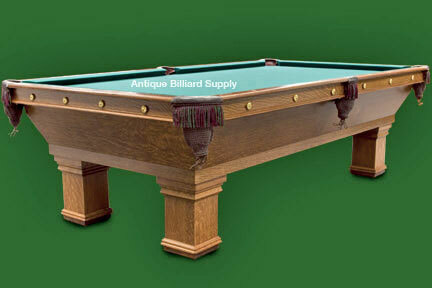 #1-01 Antique Brunswick pool table of classic design. Oak cabinet and top rails, square legs with decorative accents. About 100 years old, nine-foot size, this model provides the excellent performance typically found in more expensive tables. Solid construction, three-piece slate playing surface. Available now.